It’s hard not to want to welcome the arrival of spring. This is especially true since my winters hold a lot less skiing than they used to and a lot more shoveling. Now that winter is more about searching for lost mittens than a quiet trail through a beautiful woods, there’s not much left to recommend it. If there is one thing that has begun to lean in winter’s favor, it is winter’s lack of Daylight Saving Time. DST used to be a good thing. It used to let carefree, childless me play outside after work. It used to lend itself to pleasant evenings in open-air seating with friends, food, and spirits. Now, all DST does is convince children it can’t possibly be time to go to bed. We spent all their lives training them to sleep at night, and now demand they go to bed in the middle of the afternoon. Can you believe people actually wrote to Congress asking them to prevent me from having a quiet moment to myself at night? This time of year is enough trouble without DST, but why settle for a little trouble when we can have a lot? Nobody told the sun school is still in session. He stays up late, mocking children who have to go to bed before him. Big Brother understands DST and the growing days of spring, but it still makes him angry. It’s darker when we wake him up than when he goes to bed. That must be why he prefers morning sleep. A few short months ago, Buster and Big Man (formerly New Baby) were checked out by 8. Now, 10 o’clock is a good night. They can’t tell time, but they know when they can still see the colors of things outside. Day means play. 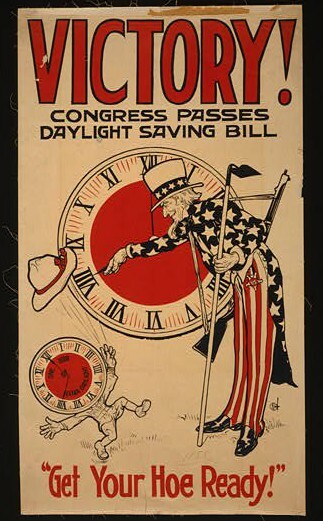 Congress must be eager to add more playtime to their days after work, the way they’ve kept spreading DST out over the calendar, but don’t those guys pretty much come and go as they please anyway? They say it helps farmers, which is something I might buy if there were more than three family farms left. Aren’t all the farms owned by G.E. or some similar giant corporation? Can’t they just manufacture bigger light bulbs to use in the corn field factory? Of all parental responsibilities, putting kids to bed is one of my top 1,000 least favorite. You know what, kids? I have work in the morning, which means I have to go to bed at a reasonable hour, which means every second you resist sleep is a second taken from the only precious little chunk of down time I’m getting today. So don’t look at the sun, or any of the natural time cues you recognize; look at the clock, that man-made fabrication dictating our lives and begging, nay commanding, you to go to sleep so I can have a quiet cup of tea, or during these rough nights of Daylight Saving Time, scotch. On the other hand, I don’t relish the idea of them getting up at 4:30 a.m., so can I get three cheers for that wonderful sunrise delayer known as Daylight Saving Time? This entry was posted in Toddler Trouble and tagged bedtime, children, Dads, Daylight Savings Time, family, fatherhood, humor, kids, parenting, seasons. OH, the changing of the time! Crap. My 11 year old is already pressing the envelope. 8pm was the deadline that slowly crept to 8:30. He and his sister have to share a room, so there’s always the 15/20 minutes of chatter that often results in someone leaving the room to come and complain about the other… so the whole “going to bed” process takes awhile and we have to start it sooner. Bed by 8 so you’re asleep by 8:30. So mommy can have mommy time. However, with the volume of homework, and if you want to play sports (practices), my son is having melt downs because he has no “down” time and dad recorded the Duck’s Hockey game. So they start watching and it’s 8:30. By 9, I’m like- it’s time to go to bed. He’s having melt downs every day after school while doing homework, because he’s too tired. We don’t have TV during the week. But, dad disagrees “Let’s just watch the Power play..” that takes forever! He got into bed last night at 9:30. Meanwhile, the sister who is 2 years younger, if he gets to stay up, I get longer… So now my 9 year old is having less sleep and mannnn, after school she is a TIGER. Stay away from her claws. I’m going to have to revisit this whole extended time thing this weekend with my dear hubby. Spring soccer is over for us and our team got eliminated from the Stanley Cup Playoffs weeks ago, so why do we still have to go through this every night? The big one moans and groans, but he does (slowly) get into bed. The little ones are more trouble because they cannot yet be coerced into going to sleep. My kids (when they were younger) were always afraid they were going to miss something. They were under the impression mom and dad were holding “parties” and they didn’t want to miss out. 🙂 We know you are doing something fun… not without us you’re not. You mean you guys don’t have big parties where you break out the LEGOs and make your own snow cones after the kids are asleep? What’s wrong with you? SSsshhh, that was a secret. Who told! Parenting is always such a challenge, especially the things we can’t control. 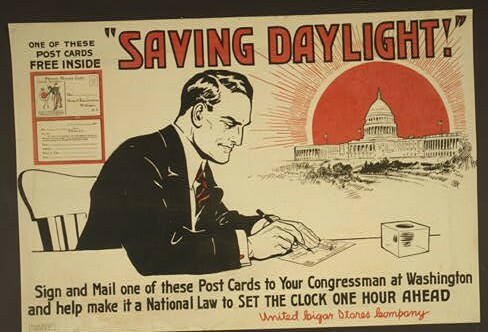 Did they really have postcards like that and that’s how daylight savings came about? I’m starting to wonder if there is anything we can control. And yes, that’s a real poster from the Library of Congress archives. Ah yes, those in between years when they still need that bedtime but are old enough to argue…….I mourn the loss of your downtime with you…..I’ve always thought there was just something wrong in the fact that we who have to care for those kids have so much less energy than those kids! Just not right all the way around! No it isn’t right, but they just have no respect for my advanced age. Maybe I should have done this fatherhood thing when I was young. Nobody said anything about a restful night. I just want a few minutes to myself. I’m full of lofty ambitions like that. You are cordially invited to move to Arizona, Scott. We don’t do DST http://www.timeanddate.com/time/us/arizona-no-dst.html . My kids still don’t go to sleep on time so what’s my excuse?! Just think 15 years from now you will be able to go to sleep and your boys will put themselves to bed around 10. You’ll have an hour of reading before falling asleep…until then, know that I feel your pain. It’s only 15 years, or around 2030 if the world still exists by then. Great. Now I’ve got to factor in the odds of Armageddon too. Thanks for the pep talk. It really helped me find a clearer perspective. Early to bed, early to rise. You can set your clock to it. Now that Savings time in eight months of the year and Standard time is four months of the year, Scott, isn’t Savings time Standard? And we all really know it’s not REALLY saving anything in the first place. 🙂 Oy to its ever-advancing arrival. In our house, it’s Early to complain about having to go to bed, early to complain about having to rise. But school’s almost over, so maybe that will bring some relief. Bless ya, pops. Really. You oughtta write a blog about this stuff. I might just do that one day.